NOTE: Does not include mask, hands, or feet. Does it ever feel like something is holding you back? Like you're tangled up in an unnecessarily-complicated web of blood vessels and nerve tissue? Does it feel like you're always pulling around a bunch of dead weight? Does it feel like there's something deep inside you that you're dying to get out? Don't despair: it happens to the best of us. Maybe that's why this Plus Size Scary Skeleton Costume is always so popular! Just kidding! We skeleton people don't have the thickest skin, so we try to keep things light. It's not difficult, because we have a great support system. So don't fall to pieces if some spineless creep says that your costume is bare-bones. Stand up for yourself! 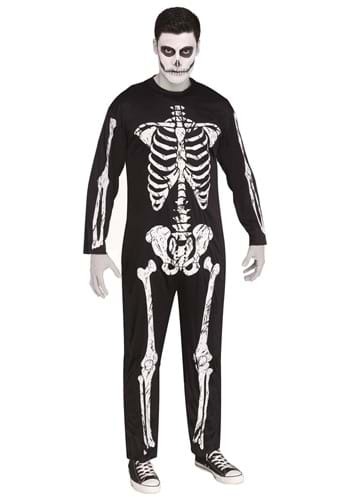 Let him know that skeleton people like us prefer the term bony-casual. Sure, we take pride in our appearance. We're just not easily rattled!